Paul Quinn College is a four-year, private, coed, liberal arts college affiliated with the African M…. 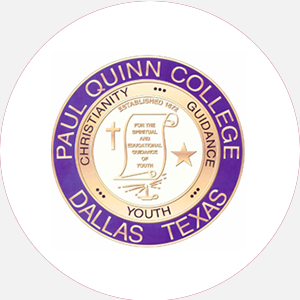 Paul Quinn College is a four-year, private, coed, liberal arts college affiliated with the African Methodist Episcopal (AME) Church. It was founded in 1872 by a group of black circuit-riding AME ministers. Originally located in Austin, Texas, Paul Quinn moved to Waco in 1887 and to Dallas, Texas, in 1990. The campus has twenty-four buildings, is situated on 150 acres, and includes dormitories, a library, and a chapel. Paul Quinn College is accredited by the Southern Association of Colleges and Schools to award the Bachelor of Arts, Bachelor of Science, and Bachelor of Applied Science degrees. Percentage of students receiving financial aid: 98 Financial Aid Specific to the School Academic merit scholarships: Awarded to students based on test scores, GPA, community service, and extracurricular activities. July 15 (fall); December 15 (spring). Graduation from an accredited high school (or equivalent) and completion of the following units: 3 English, 2 mathematics, 2 science, 2 social science, and 6 electives. Students must submit an official high school transcript with a minimum 2.0 GPA. A nonrefundable application fee is required. Admission Application Deadline: July 15 (fall); December 15 (spring). Admission Contact: Director of Admission, Paul Quinn College, Dallas, Texas 75241; Telephone: 241-302-3520; 241-302-3613 (fax). A minimum of 128 hours and completion of core requirements; 30 hours in residence. Campus Services: Health services, personal counseling, student employment services, chapel, and religious activities. Campus Activities: Social and cultural activities include theater, chorale, and dance. Students may get involved in the student-run newspaper and yearbook. Leadership opportunities can be found in the Student Government Association (SGA), organizations, or fraternities and sororities. Honor societies are also represented on campus. Housing Availability: 262 housing spaces. August-May Commencement and conferring of degrees: May One summer session.